Looking for a long-lasting, classic shading solution for your windows? Window shutters are classic and never go out of style. They come in a variety of styles and materials. Exciting Windows! can help you choose the style right for you. We offer wood shutters, plantation shutters, cafe shutters, and composite shutters. They can be opened or closed to provide varied light, privacy and insulation with a handsome, custom appearance. Exciting Windows offers you options when you select popular plantation shutters. Whether you choose the classic look of traditional wood, or the long-lasting and budget-friendly synthetic materials, Exciting Windows’ commitment to custom solutions continues. Peruse our variety of colors and materials to create the look and functionality that is just right for your home. A great option in Colorado’s intense sun, Plantation shutters are long-lasting and able to stand up to our state’s dramatic weather. In addition to their money-saving functionality, order classic and fashionable plantation shutters to create a truly finished look and add value to any home. Schedule your no-cost consultation today to learn more. 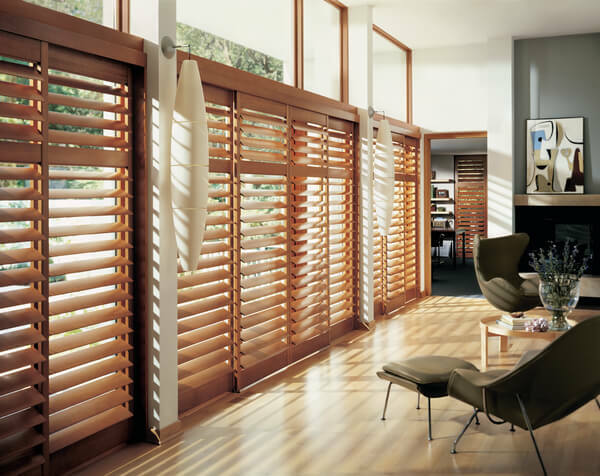 Exciting Windows proudly provides the best plantation shutters on the market, including Hunter Douglas and Norman. When you schedule your no-cost consultation, Exciting Windows’ certified professional designers will arrive with samples of our variety of plantation shutters for you to peruse in the comfort of your own home. You Choose the Look, We Do the Work! Exciting Windows will handle all the measuring and professional installation for this popular window covering option. Schedule a Free In-Home Consultation or call us today at 719-548-1020.